There are multiple ways a C++ program may terminate. These include both normal and unexpected termination. 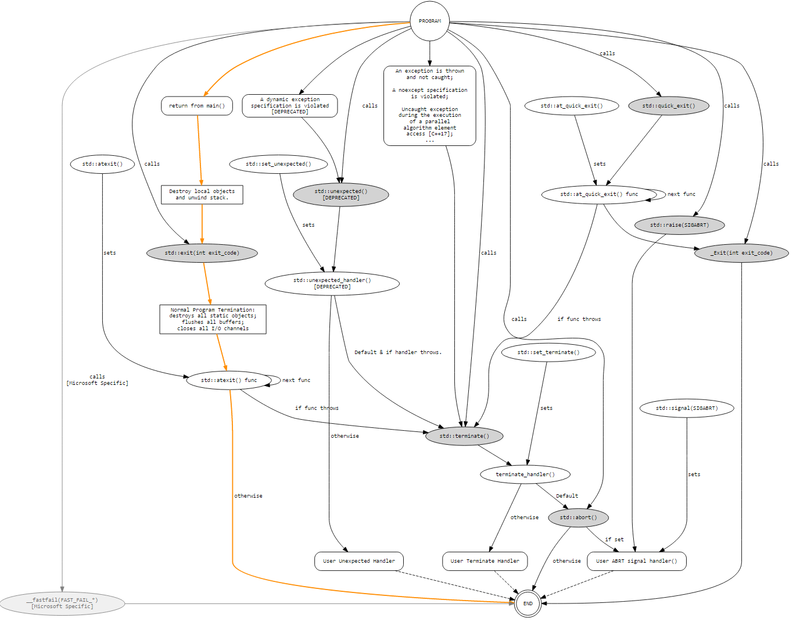 This GraphViz diagram shows the program termination flows as defined by the standard. It is a big one so probably better viewed on the github link. In C++17 Fold expression reduces a parameter pack over a binary operator. It is a way to apply the same binary operation ( for example +, <, || ) on a parameter pack . std::sort - is the most common sorting algorithm. It is required to have average O(N·log(N)) by the Standard so its usually a quick sort. It takes two random access iterators and an optional comparison function. From C++17 it can be parallelised with first argument the parallelization policy. std::stable_sort - guarantees the order of equal elements. When sorting for example pairs of something on their first we want the ones with equal first to retain the order. Usual use case is sorting elements by second and than partially sorting them by first - when displayed the elements will be sorted by first and than by second. Similar complexity also parallelizable. std::sort_heap - sorts a heap but the sorted range looses the heap property. Its more efficient to use sort_heap if you already have a heap instead of std::sort. Complexity is 3 * distance(first, last). Not parallelizable. Additional related STL algorithms: nth_element, partial_sort_copy, max_element/min_element (yea! max/min_element - specializations of partial_sort!!!) and I probably missed something. STL has a lot of stuff. Hana is a header-only library for C++ metaprogramming suited for computations on both types and values. The functionality it provides is a superset of what is provided by the well established Boost.MPL and Boost.Fusion libraries. By leveraging C++11/14 implementation techniques and idioms, Hana boasts faster compilation times and runtime performance on par or better than previous metaprogramming libraries, while noticeably increasing the level of expressiveness in the process. "f(f(f(f(1, 2), 3), 4), 5)"
I was short on time and energy and I decided in the future when the weekend comes to start the next week tips without filling the previous one. It will zero my tip-debt and I wont get stressed by debt accumulation. Apologies.